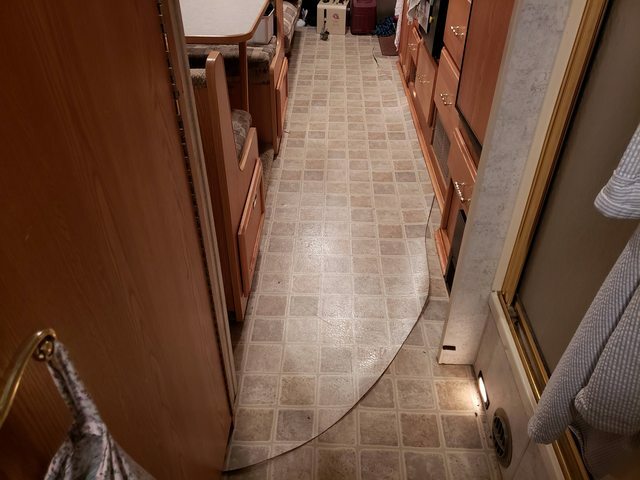 Went and checked on the RV for the first time in 3-4 weeks and was shocked at what I found. 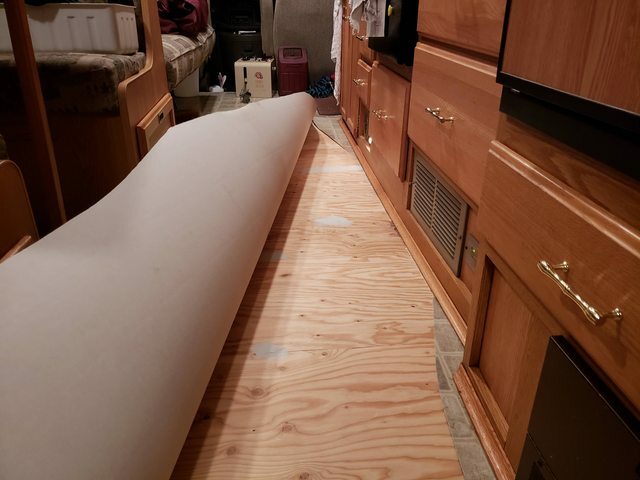 The Vinyl floor was split almost the whole length of the RV. I'm sure it's cold weather related, Anyone see this happen before? Happens all the time. Vinyl is put on before all the partitions and cabinets, and cannot expand or contract when the temperatures change. All too common. Easy fix. Vinyl plank flooring is a great DIY alternative and pretty reasonable to do. Yes, all too common in the cold. I would contact my ins. co. I installed that in a rebuild and it spread apart at the seams. It was in the summer here and when it cooled down it shrunk. I ripped it out.Is there a certain type ,are they all the same. My rig now has peel and stick squares and some have loosened but nothing serious. Yes we had the exact thing happen, I would have guessed it was our trailer. Our warranty had just expired by a month or two, went back to the dealer and it had happened to another trailer as well so the warranty covered it. It was our lucky day....should have bought a lottery ticket that day! Yes it is the cold. If they glue down the entire vinyl floor it is usually OK but the manufacturers like to save time and money by only gluing the edges. Not uncommon here with units imported from the U. S. Ours was a factory order in 2008 and we specified full glue down. It got through the first 10 winters OK. Hope it has survived the latest cold spell. When new, it's fairly stretchy but after a few years, the plasticizers evaporate off (that's what give you that new car smell) leaving it more brittle...eventually the combination of brittleness and an very cold day causing it to shrink will stretch it more than it can take and a split will start. Yours is only unusual in the sense that typically it's only a few inches near a corner and that relieves enough stretch that it doesn't split any further. Oh, that is a downer. I have seen house-hold laminate flooring used often in interior restorations. Obviously you will want to install the product in warm weather so it is pre-expanded....in case it changes with temperature. Shrinking laminate flooring should not be an issue. If it does shrink, you would just see a small gap along the edges. But reuse your base shoe and you will never see a gap. 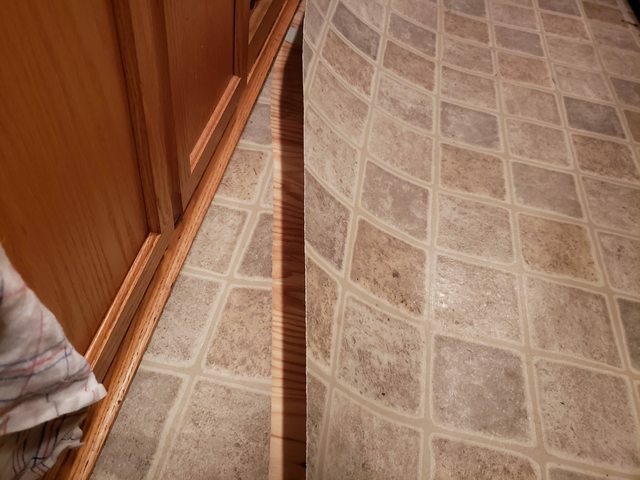 Just be sure to attach the base shoe to the cabinetry, not to the floor to allow the floor to move under it as temperatures change. Laminate flooring is a floating floor by design. You lay down a thin foam base underlayment and then lay the floor over it without any type of attachment. It just lays there. The interlocking features will keep it together. If it gets air born in a bad bump, the thin foam pad will keep it quiet. It must work because it is common practice.